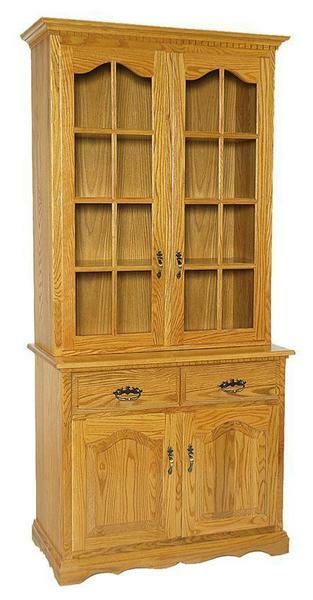 Traditionally used to display fine china, crystal and other figurines, the beauty of the Amish 40" Full Two Door China Cabinet is that it can be used for china, but these days it can be used to showcase many other things as well. This wood china cabinet with its grand doors that open to fine shelving and its drawers and lower storage cabinets is completely customizable. These days, the traditional china cabinet can be used to store books, candles and toiletries, blankets and linens, plants and of course fine china and crystal. Amish made furniture is going to last. This china cabinet is one that will grace your home for decades and then can be passed on for family members to continue enjoying it. We can get the custom furniture process started by sending you wood samples to consider. Click and select your options or feel free to get in touch with a Furniture Specialist to guide you. We can be reached by email or phone. Thank you for shopping with DutchCrafters.